Last Monday was a Terrible, Horrible, No Good, Very Bad Day. Mondays can be like that. Take for example, this Monday. No, no, no I’m not going to tell you what made this morning bumpy. You know the endless ways there are to get off track! But I will tell you what made me smile in the face of, you know. Salad in jars. That’s right, salad jars. 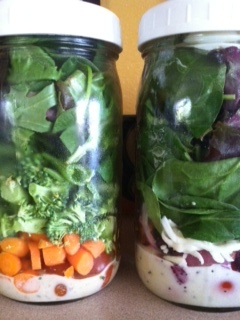 If you want the nitty gritty about How to Pack the Perfect Salad in a Jar then click the link. It is a perfect tutorial and blog post. But perfection isn’t what’s happening in our family right now and the good news is that salad in a jar doesn’t have to be perfect. Here’s my tip. Go to Costco and purchase a large gourmet salad kit (for example, the one with a sweet dressing, hardboiled egg, and bacon) for $9.99, a large veggie tray for $9.99, and a large box of salad greens for $3.99 . And purchase Annie’s Homegrown Goddess Dressing or some other delicious salad dressing that is unusual enough to not tempt you to make your own instead. We’re looking for speed, convenience, and delicious. Now grab some jars. Wide Mouth Canning Jars work well in both quart and pint sizes, and for a one-step lid use these Plastic Storage Caps . Next day, again make a dinner salad, using boxed salad greens and veggies from the tray, sliced. Add some vinegar, olive oil, Italian seasoning, toss. Serve. Take your delicious bottle of salad dressing and pour some into (2) quart jars. Add vegetables from tray, slicing as needed. Top with more salad greens. (Pictured on left.) Reserve extra vegetables to be served with dip included with tray. Use any remaining salad greens on sandwiches. Why are salad jars better than bagged salad? They are better quality, easily customized to taste, easy to control portions and calories, and less expensive. Why do salad jars make me smile? Because nutritious and delicious meals and side dishes are ready for this week, regardless of how bumpy this morning was. Take that, Monday. I love this idea, Angie! I’ve been looking for more convenient ways to make and serve salads. And aren’t the glass jars, pretty?! Do let me know when you do and what ingredients you include. I’m sooooo ready for warm weather food 🙂 Thanks, Jenn! Thanks for the link love 🙂 Cooking makes me very happy, hugs make me happy, sending & receiving snail mail, listening to upbeat music…luckily I have a few tricks up my sleeve to brighten a bad day. Hope the rest of your week goes more smoothly! I was skeptical about the salad in a jar but I can attest they taste great and travel well. Keep the great food coming! Exactly! So pleasing 🙂 And I just watched your movie and wish you every happiness! Foods that make me smile – aside from the obvious like chocolate, lol – deviled eggs. 🙂 Sunshiny yellow and tasty good. Oooo, I love deviled eggs! And egg salad! And pickled eggs 🙂 Easter eggs are coming soon too! Thanks, Ness, the week continue to improves. Ah ha! Love it! I’ve discovered that it doesn’t really make sense to pack a whole meal for work (fruit, granola bars, and a protein drink work fine) but I’ve been coming home and making salads…I should just bite the bullet and make them ahead.